The manga megahit Attack on Titan, reinterpreted by some of comics' top talent! 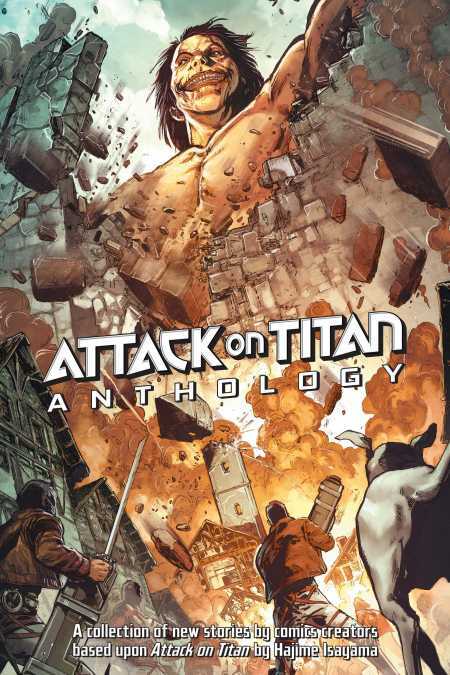 This Diamond PREVIEWS Exclusive Edition of the Attack on Titan Anthology is limited to 3,000 copies and includes a special cover featuring new art from Phil Jimenez! Featuring original stories by a long roster of comic superstars such as Scott Snyder (Batman, American Vampire), Gail Simone (Batgirl), Faith Erin Hicks (Adventures of Superhero Girl), Michael Avon Oeming (Powers), Paolo Rivera (Daredevil, Amazing Spider-Man), Cameron Stewart (Fight Club 2, Batgirl) and Faith Erin Hicks (The Adventures of Superhero Girl)! This unprecedented, full-color collaboration between East and West will be released first in English, making it indispensable for Attack on Titan fans and curious comic fans.